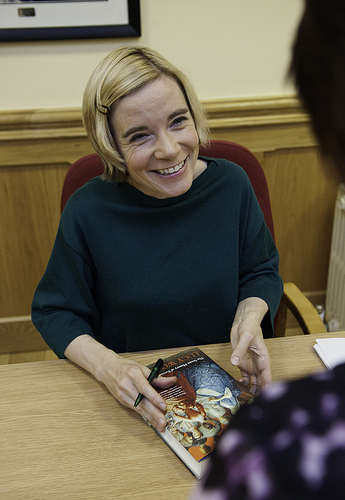 Lucy Worsley investigates domestic history with humor and panache. I first learned of today&apos;s interviewee in a New Yorker article. By day, Lucy Worsley is Chief Curator at Historic Royal Palaces, the independent charity that looks after The Tower of London, Hampton Court Palace, Kensington Palace State Apartments, the Banqueting House in Whitehall and Kew Palace in Kew Gardens. She&apos;s also a writer, most recently the author of If Walls Could Talk: An Intimate History of the Home and host of the BBC4 series Elegance and Decadence: The Age of the Regency. On that series, Worsley she creates living history by cooking the same food, using the same chamberpots, cleaning the clothes with the same pee (yes) and brushing her teeth with the same powdered cuttlefish bone as our forebears, to see how they really lived. I’m fascinated by her cool job and fun attitude towards history. Are there any sites you haven’t been able to get access to that you’d love to be able to explore? I’m always visiting historically-interesting new houses for filming or research – that’s why my work is fun! I love meeting other curators and experts, and often they’re quite pleased that someone’s interested in their own special house or site or museum or whatever, so they tend to let us in. Do you ever crack up during filming? I ask after watching a clip of you talking about codpieces where there’s a codpiece basically next to your face. Indeed. Sometimes the giggles just seem to come from nowhere and we have to have a break. Likewise for hiccups. What are some foods that are no longer in fashion that should be? Hum, I’d suggest bringing back brawn. This pate made from brains and other bits from inside the head of the pig epitomize “nose to tail” eating, where no part of the animal (and the significant investment of food, time and other resources it represents) is wasted. Brawn can be delicious, but you’ve got to know what you’re doing to make it properly. My own effort was a disgusting failure. Are there any historical U.S. sites you’d like to gain access to, to research as closely as you have so many British homes and castles? Ooh yes, I’d love to have an in-depth tour of Hearst Castle. Is it difficult for you to enjoy historical films without picking them apart for accuracy? Which films have gotten historical details the most blatantly wrong? I’m just not hung up on this at all. If I’m distracted by inaccurate historical detail, the film’s failed for me: not purely because it’s inaccurate, but because the story itself isn’t carrying me along as it should. Films are fiction; I’m willing to try to suspend my disbelief. Are there any periods you’ve studied that appear to be worse than the ones that preceded it? Interesting question. Well, history often fails to follow a straight line from “worse” to “better.” If you think about the Industrial Revolution, of course everyone got a bit richer, but you could argue that poorer people actually working in the new factories were paid disproportionately highly in terms of their quality of life. Likewise, the Enlightenment wasn’t good for everyone: For example, in the name of scientific progress, the female midwife gets pushed out of the process of childbirth by the male doctor. She and her centuries of practical experience get written off, and mothers cede control over a central part of their existence to a man they don’t even know. I know you don’t necessarily believe in ghosts, but have you had any otherwise frightening experiences during your research, perhaps where you were in physical danger? The most horrifying thing I’ve ever done was to let a TV producer talk me into taking a hot air balloon ride to film and examine the Regency agricultural landscape from on high. I have a terrible head for heights. He said I was perfectly safe but I lay in the bottom of the basket thinking about my imminent demise. What do you most enjoy when it comes to contemporary entertainment? Oh, reading novels! Heaven to me is a lovely new book and a cup of tea. What’s something you’re passionate about or obsessed with that has nothing to do with history or the home? People are often surprised when I say I love running, because I look so weedy. But despite my small stature I happen to have very large nostrils, which means I can take the air in very effectively. I can do 10km in under 45 minutes. How does it feel to be the 315th person interviewed for Zulkey.com? Super-duper. Thanks ever so much!